Dave Wardell’s memoir, Fabulous Finn, charts an incredible journey. From near death, through a complicated four hour operation, to the anxious hours and days when Finn fought for his life, and, finally, to the day when, recovered from his horrific injuries, Finn was back on the job and delivering his first catch. Fabulous Finn also charts the career of a singular, highly trained, highly decorated dog; in his time on the job he’s tracked offenders of all kinds, once for over four miles, once for over two hours - long after everyone else had given up. He’s found missing children and missing adults – some intent on suicide - tackled armed offenders, and put violent partners behind bars, so that their victims could again sleep at night. He’s tracked down both burglars and the property they’ve stolen – in one case, of a celebrated Hollywood actor, after the crew of the expensive helicopter deemed the area already cleared. Every piece of stolen loot was returned. But Finn isn’t just a police dog; he’s also a cherished family pet. Yes, Dave’s daughters know he has to go out with daddy to catch bad people, but to them he’s just their beloved dog. Who goes into schools, and does breathtaking displays. A police dog with a soft spot for kittens. Fabulous Finn is a story of loyalty and friendship. It celebrates both the bond between humans and animals, and, through the telling of Dave’s journey to become Finn’s handler (Finn might describe it differently...), of the transformative power of love and loyalty. "a moving story of loyalty and friendship." "...this lovely story about a highly decorated dog will warm the cockles of your heart." Congratulations to David Wardell and Lynne Barrett-Lee whose Fabulous Finn is No. 18 in the overall non-fiction PB charts . 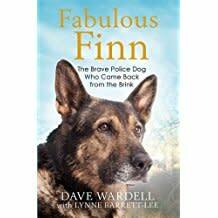 Fabulous Finn: The Brave Police Dog Who Was Stabbed and Came Back from the Brink by David WArdell and Lynne Barrett-Lee is no 14 in the paperback charts this week. 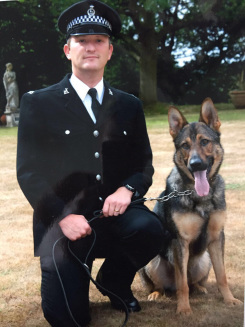 Congratulations to Dave Wardell and Lynne Barrett-Lee whose Fabulous Finn: The Brave Police Dog Who Was Stabbed and Came Back from the Brink is no. 13 in the Hardback Non-Fiction bestseller list this week. Congratulations to David Wardell and Lynne Barrett-Lee whose Fabulous Finn: The Brave Police Dog Who Was Stabbed and Came Back from the Brinkis No.8 in this weekend’s Sunday Times Top Ten. At auction Quercus have secured World English rights in Finn: The courageous police dog who was stabbed and came back from the brink, and is now about to change the law. 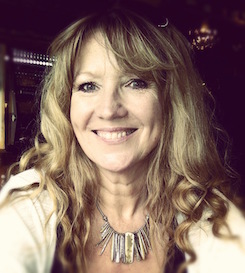 Ghosted by Lynne Barrett-Lee, it charts the relationship between Dave Wardell and his dog Finn. The under-bidder was Sidgwick & Jackson.